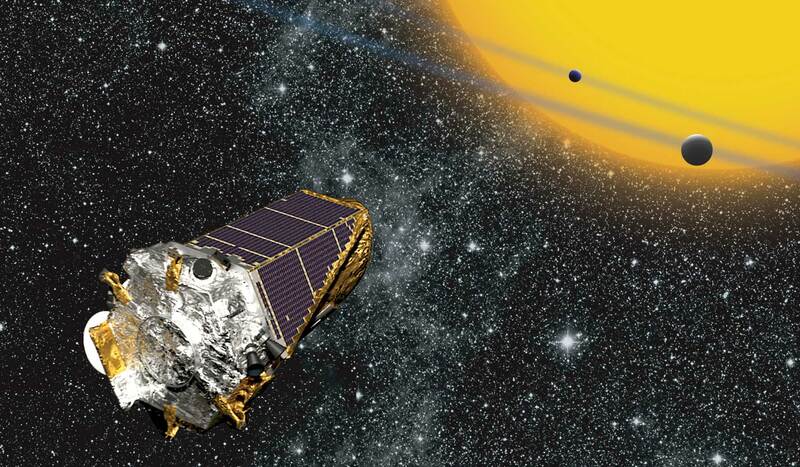 The Kepler Space Telescope will soon run out of fuel and end its mission. Here are nine fundamental discoveries about planets aided by Kepler in the 9 years since its launch. In early 2009, a rocket was launched carrying an instrument that would fundamentally change our views of our position in the universe. That instrument is the Kepler Space Telescope, a small spacecraft that opened a large window to the many thousands of exoplanets strewn throughout the Milky Way. Thanks to Kepler, we now know that Earth is not a unique pale blue dot in the universe. On 14 March, NASA announced that the Kepler spacecraft was exhibiting the first signs of low fuel and that the telescope likely would be functional for only a few more months. Its fuel tank hit critically low levels on 2 July, and mission scientists put Kepler into a no-fuel hibernation mode until its latest round of data can be downloaded on 2 August. Although this fuel failure was anticipated, it is likely the spacecraft will not reach its 10th birthday. Kepler, whose eye is roughly a meter in diameter, launched 17 years after the first planet was discovered outside of our solar system. By then, roughly 300 other exoplanets had been discovered, most of them too large, too hot, or in environments too extreme to even consider that they could harbor life. The available data left scientists scratching their heads. Did exoplanets analogous to Earth even exist? If they were out there, could we even see them? The data show that the telescope was a game changer. “It’s probably the one mission that’s changed the history of humankind more than any other,” Borucki said. Just how revolutionary has this space telescope been? Here are nine notable findings from Kepler that forever changed the field of astronomy. Imagine staring at the same patch of sky for more than 4 years. After Kepler was launched in March 2009, it did just that, turning its lenses to the space surrounding the constellation Cygnus. The telescope precisely measured the brightnesses of more than 150,000 stars simultaneously to a precision of about 50 parts per million. Any temporary and repetitive dips it saw in a star’s light might indicate that a planet had crossed between the telescope and the star. These signatures, or planetary transits, are Kepler’s way of finding exoplanets. Planets are everywhere, equally. No one area on Kepler’s map hosts more exoplanets than another. Through its unblinking gaze, Kepler discovered 4,571 planetary signatures, 2,327 of which have been confirmed as actual exoplanets. Astronomers are still working to confirm or refute planetary statuses for the remainder of Kepler’s discoveries. 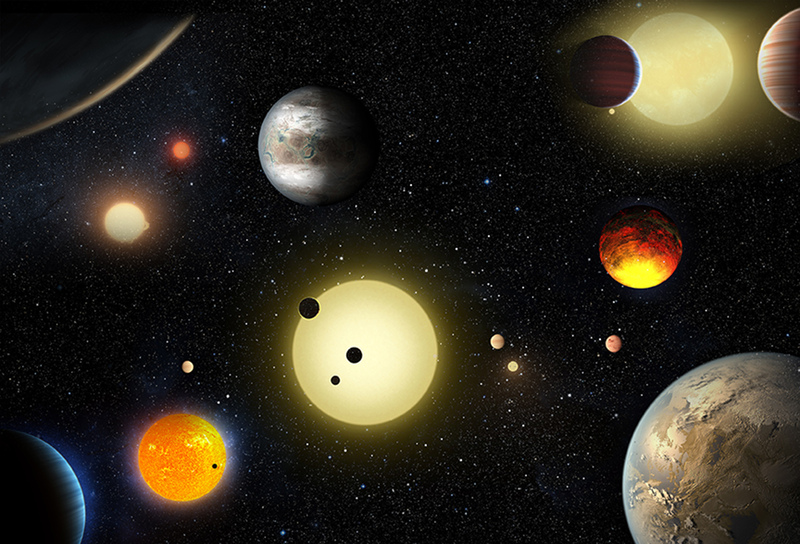 Those planets, Kepler scientists found, are everywhere, equally. The distribution of exoplanets across Kepler’s view of Cygnus follows the distribution of the stars. And no one area on Kepler’s map hosts more exoplanets than another. A hardware failure in 2013 left the spacecraft unable to accurately point at its original targets and ended Kepler’s primary mission. Despite the setback, the telescope kept on discovering exoplanets elsewhere in the galaxy after engineers found a new way to keep the craft stable enough for observations. The second phase of Kepler’s mission, called K2, began in 2014. “K2 has enabled us to explore different portions of the galaxy that were not accessible to the original Kepler mission,” said David Ciardi, a research astronomer at the NASA Exoplanet Science Institute at the California Institute of Technology in Pasadena. As exciting as the original Kepler was, “K2 was perhaps more exciting because of how we worked to never give up,” he said. The K2 mission has so far discovered hundreds of new exoplanets distributed around the Milky Way. Some stars have no planets, and some have many, but Kepler found that on average, there is one planet for every star in the sky. 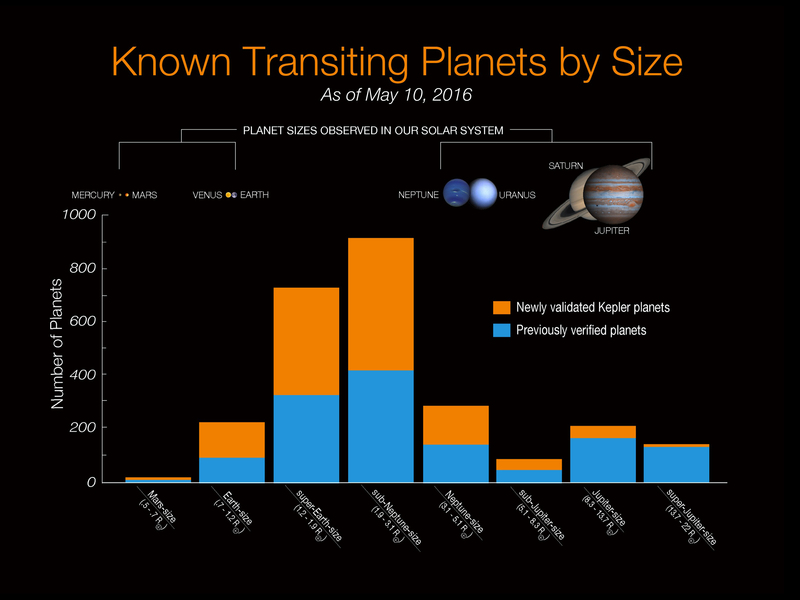 Kepler measures the sizes of exoplanets and their orbital periods when they transit their host stars. The bigger the dip in the star’s brightness is, the bigger the planet is relative to the star. The more frequent the dips are, the faster the planet orbits. If Kepler sees a star that shows dips with different strengths and timings, astronomers know that there might be more than one planet in that exosolar system. With the help of an artificial intelligence algorithm, Kepler discovered another star with the same number of planets as our solar system. The star, Kepler-90, is 2,545 light-years away and slightly hotter than the Sun. Seven of its eight planets were discovered in 2013, and the elusive eighth planet rounded out the set in December 2017. The data show that the orbits of all eight Kepler-90 exoplanets fit within Earth’s orbit around the Sun. Astronomers are not sure whether the paucity of populous planetary systems is a real phenomenon or simply due to a lack of data. Although Kepler discovered thousands of exosolar systems with one or two planets, systems with more planets than that are still relatively rare. For example, the TRAPPIST-1 system was discovered in February 2017 to have seven exoplanets, but to date, it and Kepler-90 are the only two exosolar systems with more than six planets on the books. Astronomers are not sure whether the paucity of populous planetary systems is a real phenomenon or simply due to a lack of data. One of Kepler’s fundamental science goals was to discover how common planets similar to Earth in size, composition, and temperature are in the galaxy. Pinpointing the number of these “Earth siblings” or “Earth cousins” is a stepping-stone toward calculating the probability of alien life in the universe. Earth-sized planets are very common, Kepler found. So far, astronomers have confirmed 29 exoplanets less than twice the diameter of Earth that fall in or near their star’s habitable zone, a region of space surrounding a star that has the right temperature to keep water in a liquid state on the surface of a planet. Seventy more possible Earth cousins remain as candidate exoplanets until astronomers can verify them. Given the trove of Kepler data still left to go through, astronomers are hopeful that they will eventually find Earth’s “twin.” In the meantime, a few “close, but not quite right,” exoplanets are Kepler-452b, which is slightly larger and colder than Earth, and Kepler-296e, which is nearly identical in size and temperature but orbits in a system with two stars and four other Earth-sized exoplanets. A true Earth twin will resemble Earth not just in size but in composition and temperature, too. To learn what a Kepler exoplanet might be made of, scientists need to measure its mass. For some exosolar systems with multiple planets, Kepler data can reveal exoplanet masses by measuring variations in when they transit, which are caused by the planets’ tugging on each other gravitationally. Just because an exoplanet is the same size as Earth and has a similar density does not mean it would be a nice place to live. If transit timing variations are not an option, astronomers can attempt to use other telescopes to measure the Doppler shift that an exoplanet induces on its star, from which they can find the planet’s mass. Once scientists have a measure of an exoplanet’s mass to go along with its size from Kepler, they can calculate the planet’s average density and compare it with known planet-forming materials. However, just because a planet is the same size as Earth and has a similar density does not mean it would be a nice place to live. Worlds likely to be covered with molten lava abound in the Kepler data set. These worlds are assumed to develop when a small, rocky planet orbits close enough to its star that its surface melts. Lava worlds are easier for Kepler to detect than exoplanets in habitable zones because the former orbit their stars more frequently. Two of the first rocky, Earth-sized exoplanets discovered by the spacecraft, Kepler 10b and its smaller sibling Kepler-78b, are lava worlds with densities similar to enstatite, a mineral common in Earth’s mantle. Fire and lava are common, but Kepler found plenty of ocean worlds, too. The sizes and densities of these exoplanets suggest that they contain a significant amount of water, perhaps enough to cover their surfaces entirely. Planetary temperatures, inferred from their distances from their host stars, suggest that their surface waters are liquid. Kepler-22b, discovered in 2011, was the first example of such a Kepler ocean world. With so much water on its surface, Kepler-22b almost certainly has an atmosphere, said Borucki, who called it one of his favorite Kepler planets. In an uncomplicated universe, a planet orbiting within a star’s habitable zone would, by definition, be hospitable to life. Some stars, however, pose more challenges to habitability than others. For example, stars smaller than half the Sun’s size emit more red and infrared light. An exoplanet orbiting in that star’s habitable zone would quickly become tidally locked to the star, with one hemisphere too cold and the other too hot for life as we know it to thrive. These red dwarf stars can also produce extreme flares that emit harmful X-rays and particles that could scour away a planet’s atmosphere, oceans, and, possibly, life. These stars, however, are the most common type of star in the galaxy, and Kepler observed thousands of them. The telescope discovered more than 1,000 possible exoplanets around red dwarf stars during its primary mission. One of those planets, Kepler-186f, is one of Ciardi’s favorites. If the exoplanet transits the star, the moon might, too, making it possible that exomoons lay hidden within Kepler data. So, Borucki explained, the hunt for exomoons is on. There has been one promising Kepler candidate identified, but there are no verified exomoons yet. Planets in our solar system fall into two categories: small and rocky, like the inner four planets, and large and gaseous, like the outer four planets. What’s more, there is a large jump in size between our largest rocky planet, Earth, and our smallest gassy planet, Neptune. There is no in-between. So astronomers were understandably surprised to find that things don’t quite shape up that way elsewhere in the galaxy. Kepler discovered that the majority of exoplanets are larger than Earth but smaller than Neptune, a variety unseen in our solar system. These exoplanets are called “super-Earths” or “mini-Neptunes” and can be mostly rock, mostly gas, or mostly water. In addition, there is a significant fraction of Kepler’s exoplanets that are larger than Jupiter and orbit extremely close to their stars. Called “hot Jupiters” because of their size and temperatures, these behemoths typically orbit a star in a matter of days. Astronomers are still puzzling out how hot Jupiters managed to move so close to their suns without falling in. Our solar system’s planets orbit around one star. But Kepler found that exoplanets can orbit two, three, or even four stars with relative ease. Kepler-16b was a particularly exciting discovery for Star Wars fans, as its solar system architecture mimics Tatooine, the home world of Luke Skywalker. Kepler-16b’s path takes it around both stars in that system in a circumbinary orbit, the first exoplanet confirmed to orbit two Sun-like stars. Unlike the fictional planet, Kepler-16b is frigid, inhospitable, and approximately the size of Saturn. Kepler-16b is one of only about 20 known circumbinary planets. Kepler revealed that planets that orbit a single star in a binary, triple, or quadruple star system are much more common. But what if there were even more nearby stars? The Sun was born possibly in a dense grouping of stars that has since drifted apart but may once have contained dozens or hundreds of stars. Could our solar system have formed if the Sun had remained trapped in that kind of an environment? Kepler said yes. During its primary mission, Kepler discovered two mini-Neptune planets, Kepler-66b and Kepler-67b, orbiting different stars in a distant and crowded star cluster. A few years later, Kepler’s K2 mission observed the young Hyades star cluster and found that one of its hundreds of stars hosts three planets. That star, K2-136, is the first multiplanet system known to survive in a dense stellar environment, and it could help astronomers understand the birth our solar system. The unprecedentedly large number of exoplanets with precisely measured sizes and temperatures enabled studies of planetary demographics for the first time. Kepler didn’t find just individual exoplanets. It found them by the thousands. The unprecedentedly large number of exoplanets with precisely measured sizes and temperatures enabled studies of planetary demographics for the first time. A recent study showed that planets smaller than Neptune fall into two distinct and separate categories, like two branches of a family tree. The branches were already familiar to astronomers—rocky super-Earths and gaseous mini-Neptunes—but astronomers now know that the categories represent a more fundamental planet property. Where, previously, the distinction was made purely by size or composition, it’s apparent that the two types really outline the end states of different planet formation pathways. Scientists are still working out what guides a planet-to-be down one path or the other. The thousands of exoplanet measurements from Kepler also let astronomers explore relationships between different properties of the planets—such as size, mass, composition, and star type—that theoretical models could not yet predict. For example, astronomers found that for planets smaller than Neptune, measuring a planet’s radius could, on the basis of demographic trends, allow researchers to reasonably estimate the planet’s mass and density. In addition, analysis of Kepler planets and their stars has shown that rocky planets are twice as likely and gas giants are 9 times more likely to form around stars abundant in elements heavier than helium. Kepler saw that exoplanetary orbits are not always as tidy as those in our solar system. Our solar system has a neat configuration: All the planets orbit in a mostly flat plane and move in the same direction that the Sun rotates in orbits that are only slightly skewed from circular. Kepler saw that exoplanetary orbits are not always so tidy. Some exoplanets, like Kepler-419b, a hot Jupiter around a star hotter than the Sun, orbit on highly elliptical orbits. On a scale in which 0 is a perfectly circular orbit and 1 is a flattened oval, Kepler-419b’s orbit ranks 0.83, one of the most highly eccentric orbits discovered. In the Kepler-56 system, a Jupiter-sized exoplanet somehow torqued the orbits of two other planets so they are misaligned by 45° from their star’s rotation. Another exoplanet, Kepler-63b, orbits its star from pole to pole rather than parallel to the equator, which hints that it may have interacted with another, unseen planet sometime in its past. Although some of Kepler’s exoplanets found stable orbits after chaotic interactions, others were not so lucky. Kepler-1520b, for example, at first appears like a supersized comet with its dense core surrounded by a coma and trailed by an extended tail. That’s because the planet orbits so close to its star that scientists assume that the star must be stripping away the planet’s rocky surface and any atmosphere it might have had. Had it not been for the extended tail of debris the planet leaves in its wake, Kepler would not have been able to detect this smaller-than-Mercury disintegrating world. When Kepler runs out of fuel, it will no longer be able to collect data or transmit them back to Earth. But that doesn’t mean that its work will be done. One legacy of Kepler has been inspiring and educating future generations of exoplanet scientists and astronomy enthusiasts. Citation: Cartier, K. M. S. (2018), The Kepler revolution, Eos, 99, https://doi.org/10.1029/2018EO103505. Published on 01 August 2018.